"No cooking involved in this recipe for homemade ice cream using just cream, sugar, and vanilla with your ice cream maker." In a large bowl, combine the heavy cream and the half and half. Gradually whisk in the sugar until blended. Whisk in the vanilla. Refrigerate, covered, until very cold, at least 3 hours or as long as 3 days. Whisk the mixture to blend and pour into the canister of an ice cream maker. Freeze according to the manufacturer's directions. Eat at once or transfer to a covered container and freeze up to 8 hours. See how to make rich, luscious vanilla ice cream from scratch. It was very simple and easy, however , several family members commented that it tasted like cool whip. This ice cream is so easy and has no eggs so you don't have to worry about raw eggs in the ice cream. 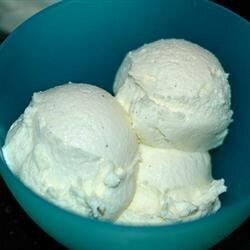 It is a lot smoother and creamier than other homemade ice creams.